But will Trinidadian police be able to convict? Or will witnesses disappear or be murdered? Once the thugs gain the upper hand in any Caribbean island, it is so difficult maintain the rule of law. Good luck to T&T authorities. How many so-called ‘fathers’ do Clarke’s children have? Can she really name each man? Who are these low men taking advantage of such a pitiful creature? The 28 year old “mother of seven” deserves to be pitied, but don’t forget to pity her children and Barbados – for it is the children and ordinary Bajans who bear the burden of so many stupid women like this one. “Single mother” ??? Let’s stop using that phrase and tell it like it is – stupid woman who doesn’t have enough sense to realize she’s being used, or to keep her legs closed. My compassion for these women evaporated long since. Sometimes there’s just nothing you can do. A young unemployed woman with a number of issues was jailed for a month after she admitted she had stolen money and jewellery from a man’s car over the weekend. 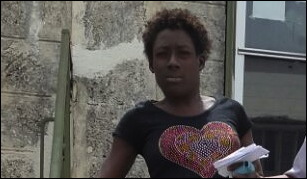 Keisha Melissa Clarke, 28, of Arthur Seat, St Thomas admitted to the offence and asked the court to be merciful on her. She was charged for stealing a pair of earrings and $87 belonging to Chris Clarke on Sunday.